Fly like a butterfly, sting like a bee. Buzz like a bumble bee and have your promotional efforts thrill your competition by taking up this product. 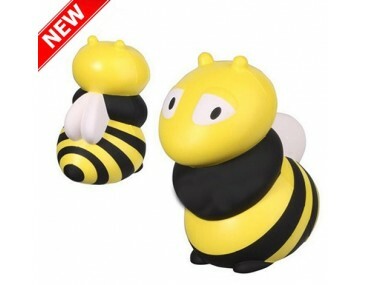 The squeezable stress relief bee is one winner item you do not want to leave out of your marketing campaign. All lovers of life and thrills flock to this, it's definitely your moment to claim this market as yours. The stress relief bee also gives you an opportunity to have featured on it, one colour print of your logo - a winning advertising strategy for your next marketing campaign. Besides, the fact that the item is relatively affordable, easy to print on and loved by many makes this deal your next go-to move any day. The perfect product to help relieve stress mainly in a work ambience. Companies put their name or logo on to this stress relief product and gift their employees which helps them in a lot of a good way. Business promotion and better employee care and rapport building with them will boost production and sales force at business. This product works in relieving stress and as a good promotional product as well. One-time print set up for custom branding will cost $65. Prices mentioned don't include GST. The product is shipped anywhere in Australia within 14 days.